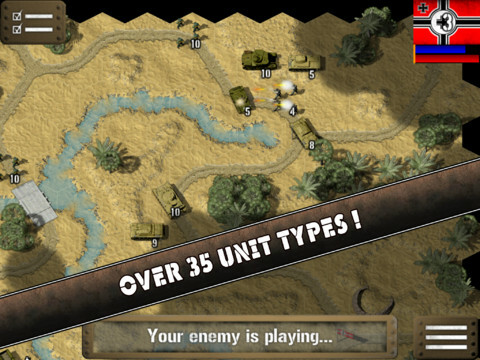 Tank Battle: North Africa is the latest new iPad wargame from Hunted Cow Studios – and it looks quite promising. Hunted Cow Studios are the makers of the excellent Civil War: 1863 game that I reviewed last September and was very impressed with. ● 5 Mission First Strike Tutorial Campaign.● 8 Mission Hope and Glory British Campaign.● 8 Mission Stars and Stripes American Campaign.● 36 Unit Types including:- M3 light and Medium tanks- British Crusader II and III- British 2pdr anti-tank gun and 2pdr Portee- Jeeps and LRDG trucks with 0.5″ MG- American Bazooka Team- German Panzer I, II, IIIJ and IVf1 and IVf2● Features British, American and German forces.● Flank Attacks● High Definition World War II Graphics.● Hours of Gameplay.● 6 Pass & Play Multiplayer Scenarios.● Game Center Achievements and Leaderboards.● Universal App (Works on iPhone & iPad)● Purchase Extra Campaigns. I’m a big fan of these sort of tactical wargames, and this one sounds like a very nice improvement on Tank Battle: 1944. I’ve installed it this morning but haven’t had a chance to try it out yet – that will change very soon. Here’s an App Store link for Tank Battle: North Africa; it’s currently priced at $1.99 – which is listed as a 33% off special introductory price.